“The scary part of it lasted only 30 seconds long. It couldn’t have been more than 30 seconds. It was so quick and so overwhelming,” said Greg Gann, a homeowner in Mayflower, Arkansas, who survived the recent deadly tornadoes by hiding in a safe room with his wife. They retreated to the room only three minutes before the tornado hit. “I knew that the world around me was spinning,” he said. Then something went wrong. The dead bolts didn’t line up, and the safe room door blew open. His wife thought it was a death sentence. Greg jumped up and found the strength to grab the door and shut it. The storm did take their house and belongings, but not their lives. “As bad as it seems—this is just stuff. We are alive,” Greg said as he stood amongst piles of debris that used to form his home. He was also surrounded by Samaritan’s Purse volunteers working to clear his site and make it possible for him and his wife to move forward. Help Storm Victims in the U.S. Powerful storm systems swept through the central and southern United States April 27-29, killing at least 36 people and causing widespread devastation in more than half a dozen states. 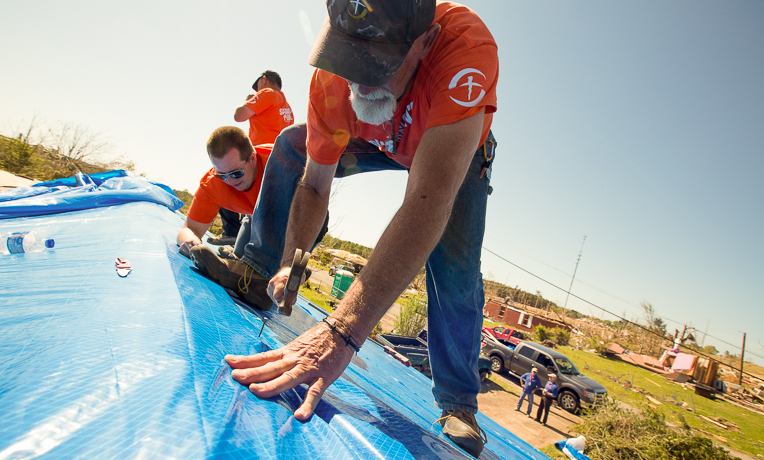 Samaritan’s Purse responded by sending staff and volunteers to five locations across four states. We established bases in Mayflower and Vilonia, Ark. ; Louisville, Miss. ; Baxter Springs, Kan.; and Athens, Ala. 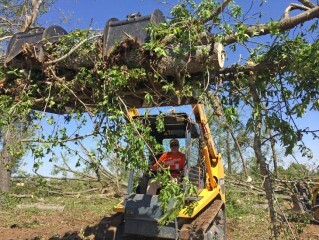 The Baxter Springs response completed work on May 10, the Vilonia response finished on May 11, the Mayflower response ended on May 15, the Athens response ended May 20, and the Louisville response completed work on May 27. Across the five responses, we served 482 homes with the help of 1,791 volunteers. As a result of being the hands and feet of Christ, our volunteers helped 72 people come to know salvation through Jesus Christ. Theresa Long’s home in Mayflower was also ripped apart by the massive tornado, taking years of memories with it. Everything was lost. Family photos. Pictures of herself as a child. She was so overcome with grief at the sight of the destruction that when Samaritan’s Purse volunteers came to help, she couldn’t even walk through the house and point to what she wanted saved. 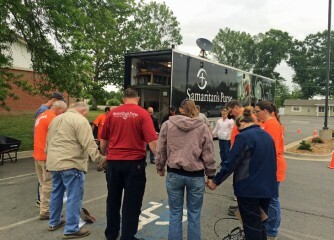 Volunteers in Arkansas pray for the people they will be helping before starting the day. When Will saw the storms on the news and received the Samaritan’s Purse call for volunteers, he drove 16 hours from Washington, D.C. to Arkansas so that he could help. He had been in D.C. making plans for work during the summer, but realized God had a different plan. He is one of many volunteers who worked to help people devastated by the storms. 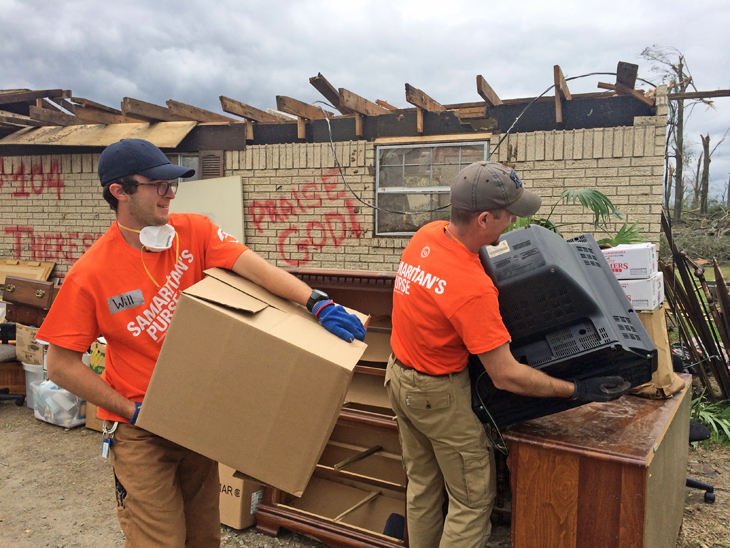 Our teams removed debris, put tarps on damaged roofs, and helped homeowners salvage personal belongings. Working in conjunction with chaplains with the Billy Graham Evangelistic Association, we shared the hope of Jesus Christ. Will said his time spent with Theresa as he helped her find remnants of her home and offered her comfort reminded him of the reason why he volunteers with Samaritan’s Purse. Similar stories have been taking place in other hard-hit communities. In Vilonia (about 30 minutes from Mayflower), in Baxter Springs, in Louisville, and in Athens, volunteers were out in neighborhoods providing physical help and spiritual comfort. Please pray for victims of these tragic storms as they continue to cope even after we leave.